Crack Pie the most addictive pie you’re ever going to eat. It even sounds legendary before you even know what’s actually inside it. It hails from New York so apologies this is yet another American bake in my around the world adventures. But I’m sure you will understand why I just HAD to bake this. 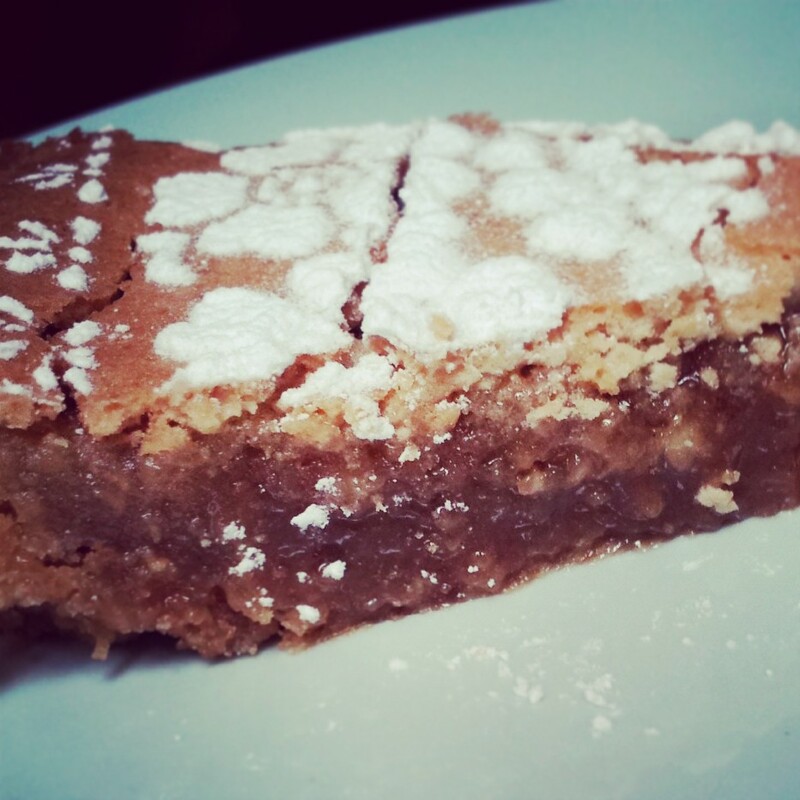 It was originally invented by Momofuku Milk Bar’s very talented pastry chefs and coined Crack Pie due to it’s extremely moreish quality. 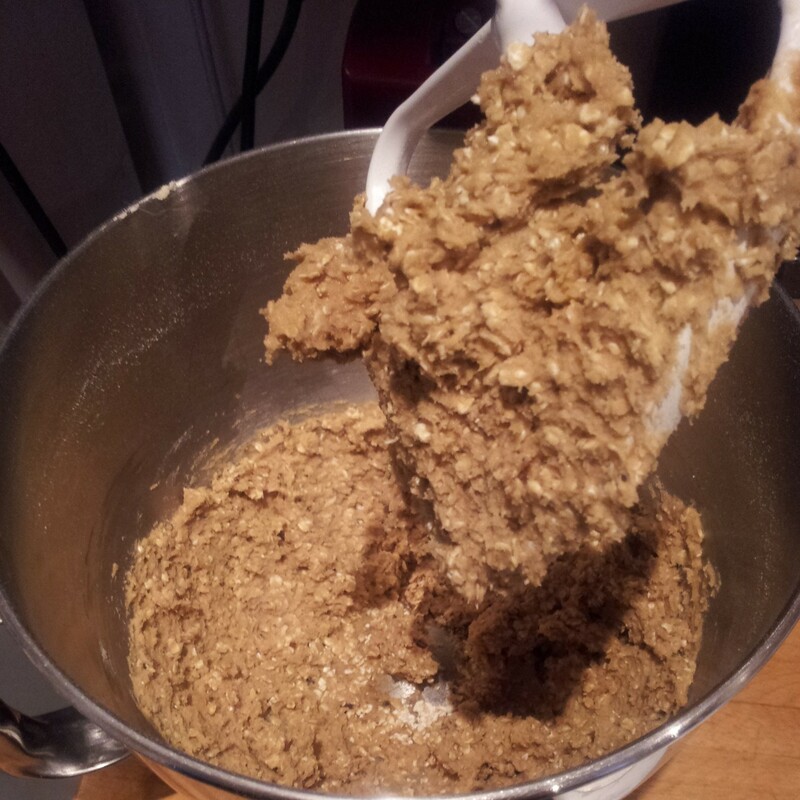 The homemade oat cookie base is well worth the extra effort of making a cookie just to crumble it up and reconstitute it into a pie crust. 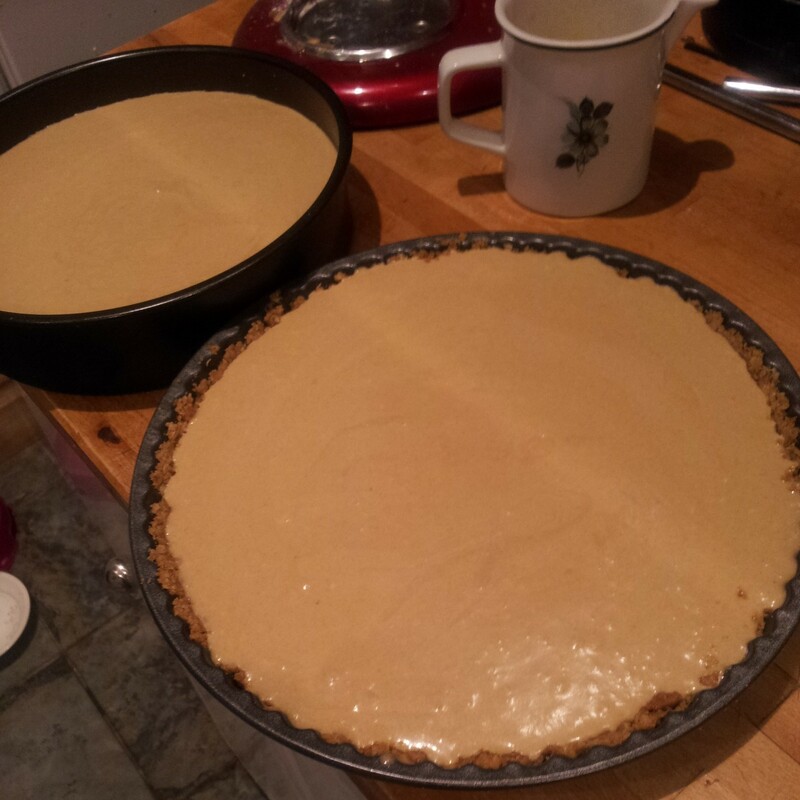 The pie in total consists of an entire block of butter, almost 500g of sugar (brown and white) 8 egg yolks and cream! This is a gloriously decadent pie for the hungry. It’s so popular I’ve heard that they sell for $45 a pop and are couriered across the states to feed the Crack Pie habit of the nation. To start with I got the method a bit backwards. Despite my lack of reading ability it turned out pretty well so you too can follow my lazy method. I forgot to cream the butter and sugar together and instead whacked all of the dry ingredients together into the mixer and beat them until crumbly. Then beat in the butter and egg to make a thick cookie batter. 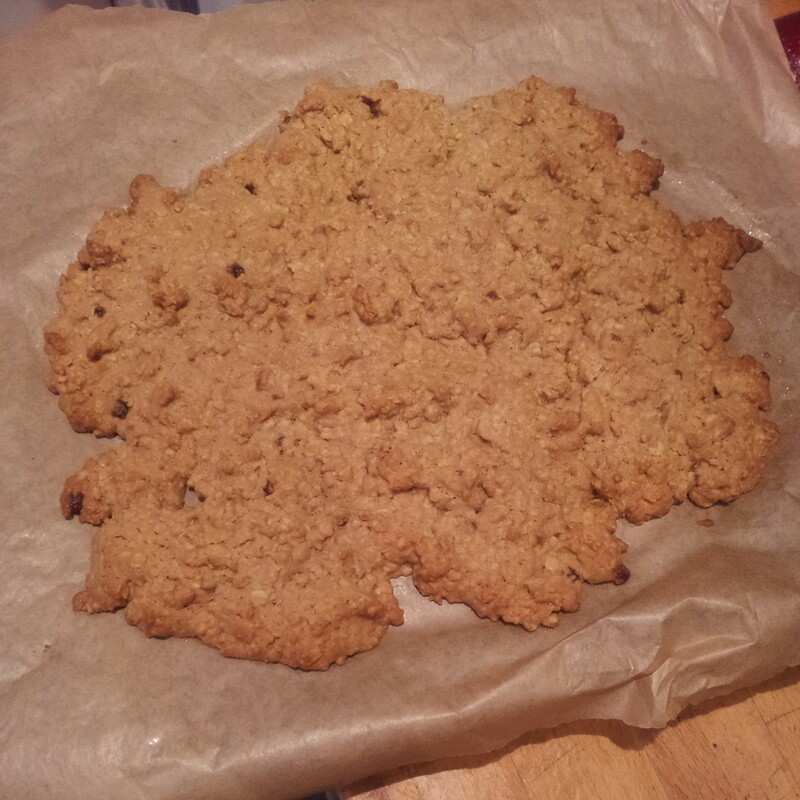 The best bit about baking this kind of cookie is it doesn’t need to be pretty and you don’t even have to bother rolling and cutting it out! Music to my lazy baking ears. 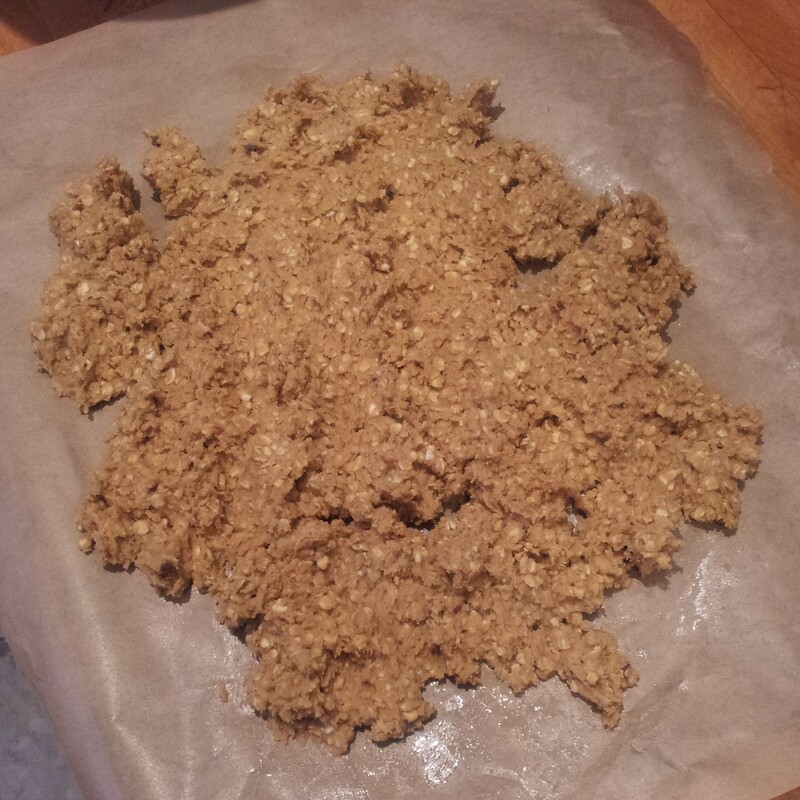 Basically whack it all onto a greased baking sheet, press it down with your fingers and bake it for 20 minutes. Job done. The rough cookie will be a lovely golden hue after 20 minutes in the oven at 160 degrees C. Technically you should let it cool down before crumbling up the cookie but I couldn’t wait. All of the other recipes I’ve found instruct you to blitz up the cookie in a food processor, but frankly that involves unpacking my food processor from the jenga game that is my kitchen cupboard and even more washing up , so I didn’t bother. 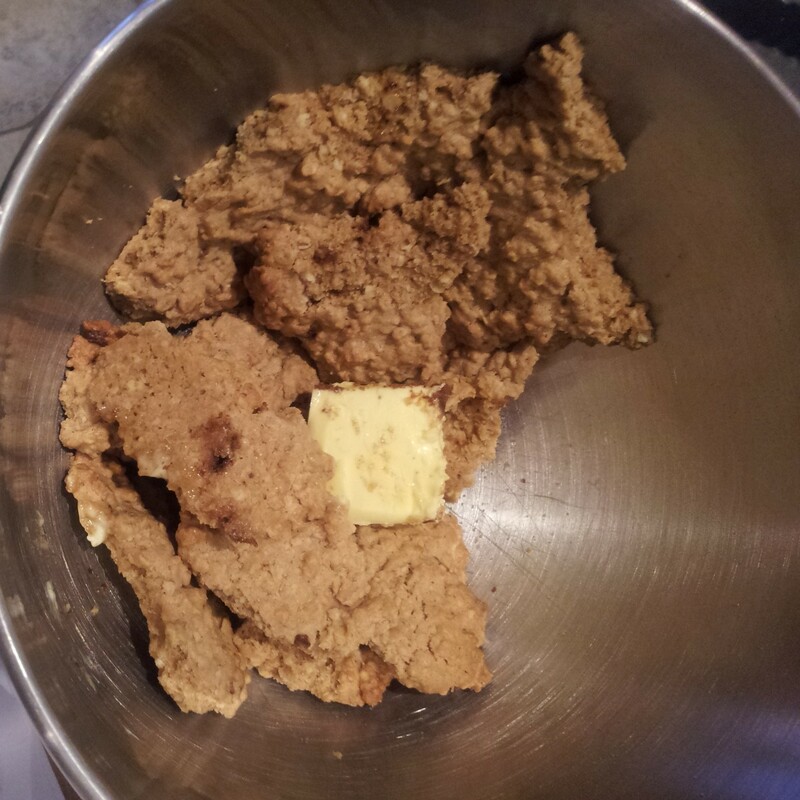 I threw the roughly crumbled cookie into my mixer and beat it into submission along with an additional 55g butter, 20g brown sugar and 1/2 tsp salt. 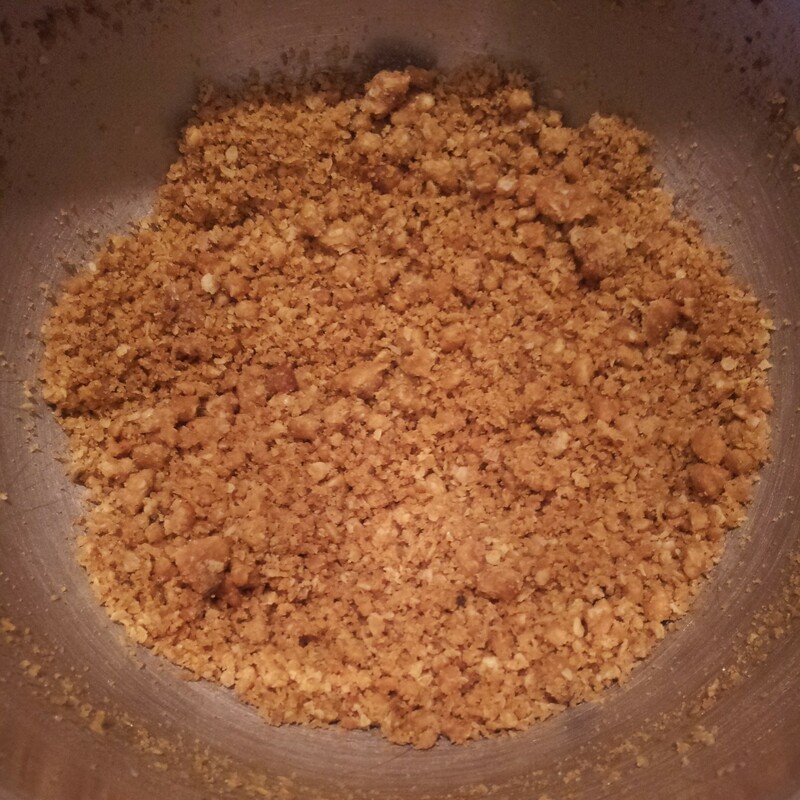 After a quick blitz with the mizer (I’m sure you could just use a spoon or an electric handwhisk if you’re feeling the strain) the cookie turn to glossy crumbs. Just moist enough to shape it into a pie crust in your 2 pie tins. Divide the cookie crumbs into 2 and squash them into 2 pie tins giving a thin and even crust along the bottom of the tin and up the sides. 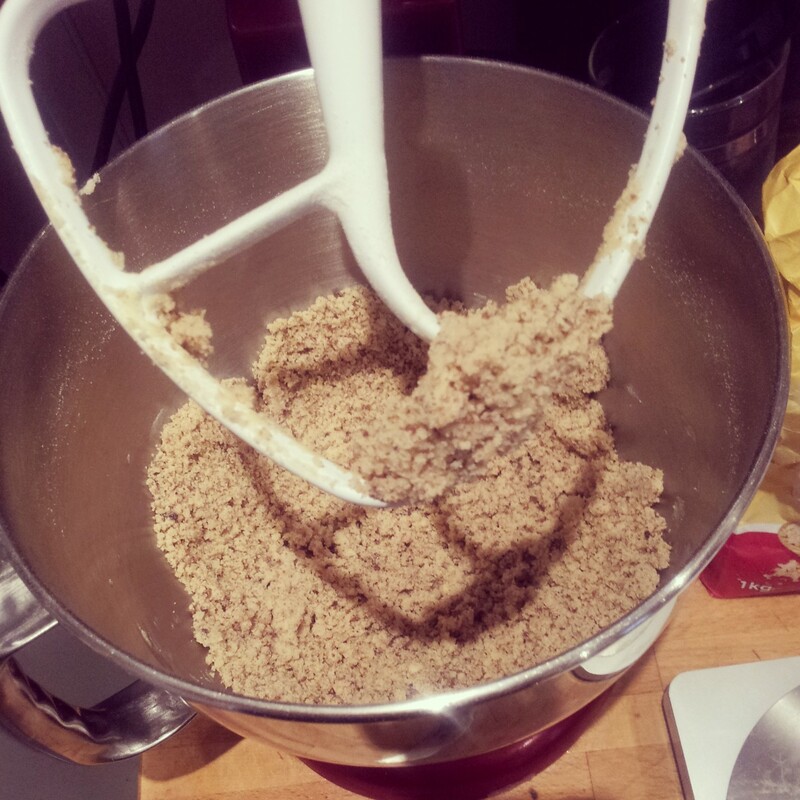 If it’s not sticking you can always blend in a little more butter to moisten the crumbs. 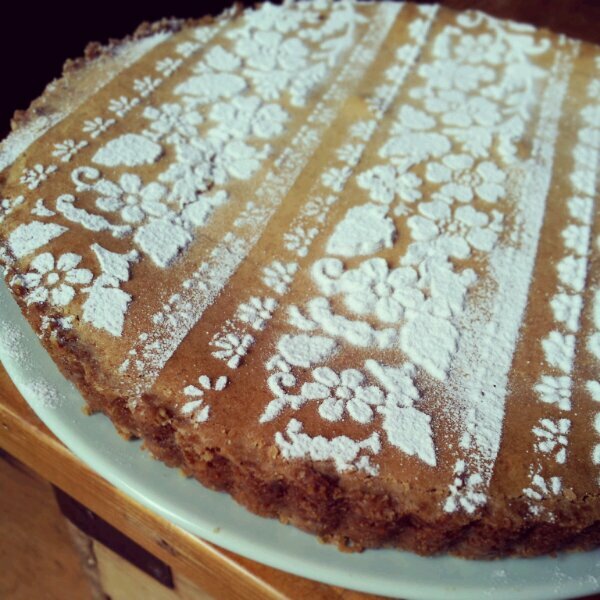 I used a 9 inch tart tin and an 8 inch round cake tin. It’s handy to use a tin with a loose bottom to help remove the pie when it’s ready for eating. But feel free to use a solid pie dish, it’ll all taste amazing anyway. Pop the crusts in the fridge to set. Now here’s the bit where I ad lib even further from the original recipe. I admit the one store cupboard essential I don’t own is powdered milk. So I just left it out of the filling. I’m not sure what impact this had on the final flavour of the pie but to be honest I didn’t miss it. Looking for a substitute all things suggested just adding actual milk. 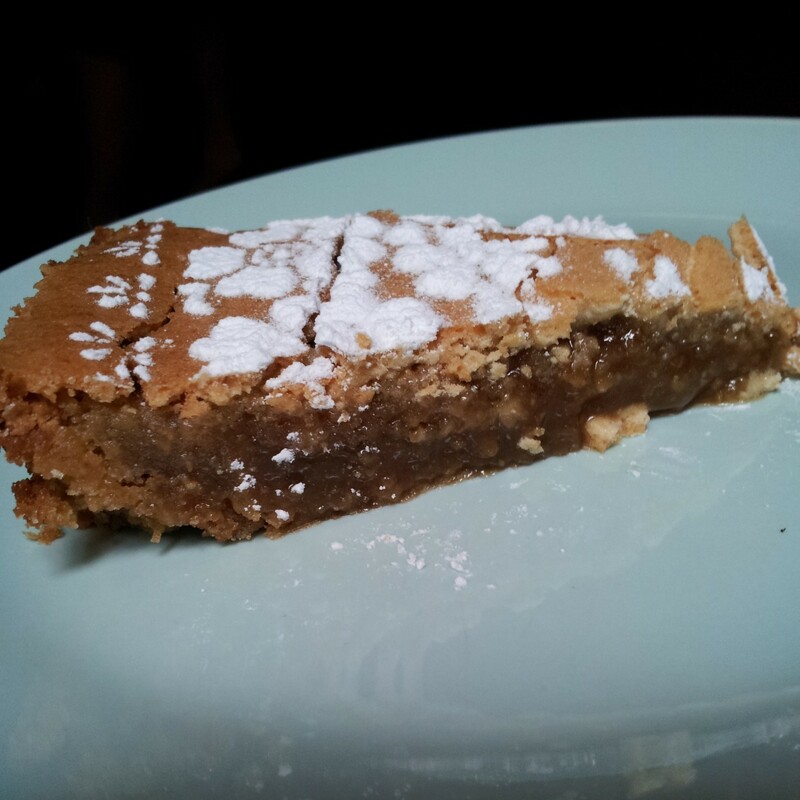 A splash of milk and a dollop of speculoos butter later and we have one tasty Crack Pie! I love the fact that you just have to keep adding to the one pot to make each stage of this pie. 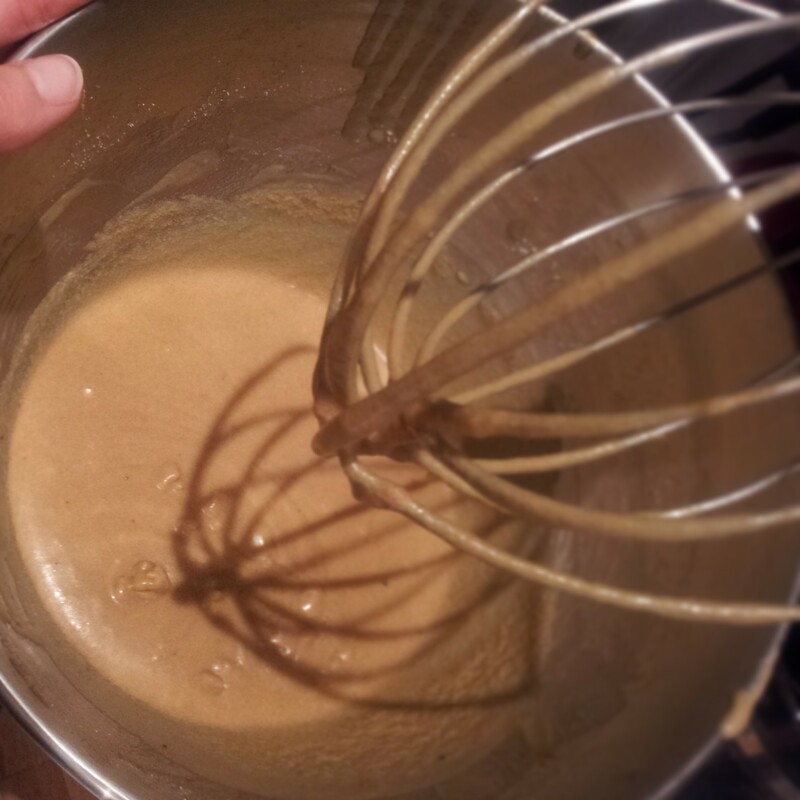 After blending together the white and brown sugar, all that’s left to do is to whisk in to the sugar the melted butter, the double cream, a splash of vanilla, a splosh of milk, and a dollop of speculoos butter. You don’t need to incorporate lots of air into this caramel custard so just whisk it until it’s smooth and everything is incorporated. A good tip from Mary Berry to achieve an even bake is to place your pies onto a hot baking sheet. 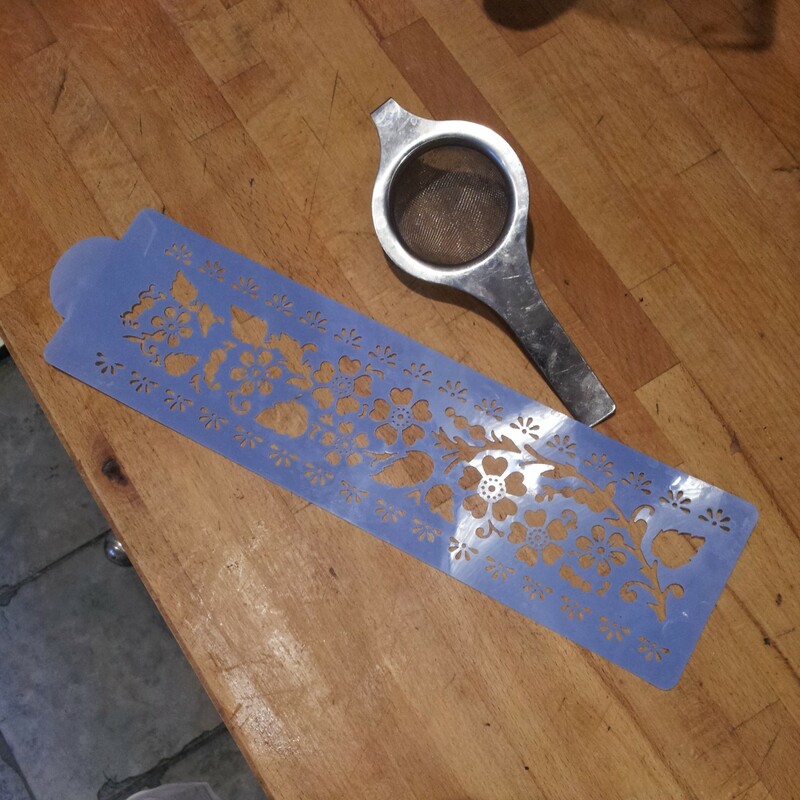 It also means your loose bottomed tin will keep it’s bottom when lifting it in and out of the oven (I have had issues in the past with my tart tin). Also if it leaks any butter (and let’s face it with all of the butter in this pie it’s going to ooze a little) you will save a lot of oven cleaning by having your pie on a baking sheet instead. 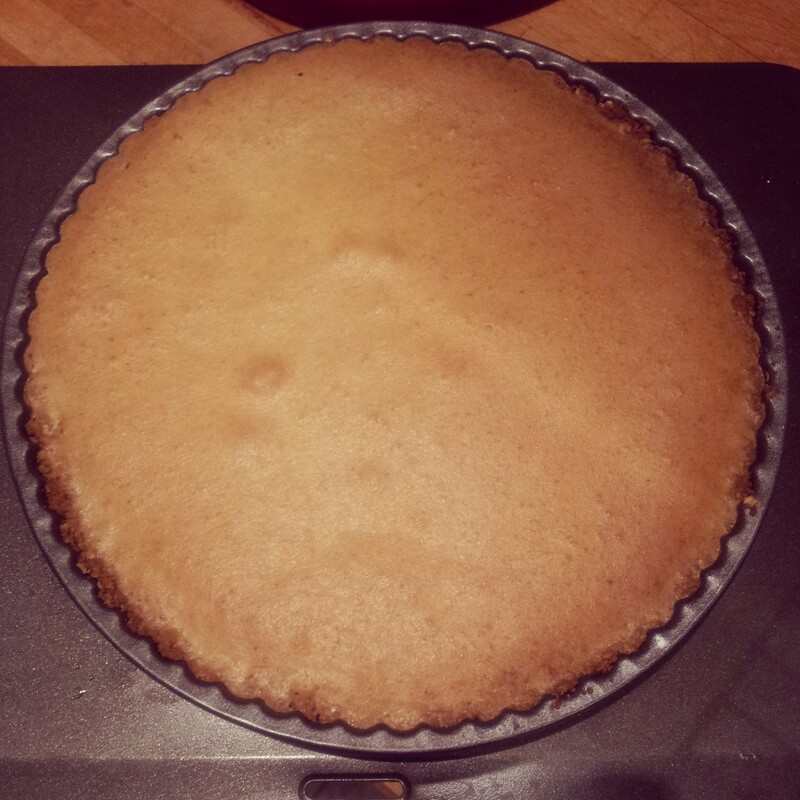 The filling will rise slightly whilst baking but maintains a lovely smooth and flat top. Once baked leave your Crack Pies to cool down in their tins. They will keep well for about a week in the fridge and I hear it tastes even better the longer it lasts… (if you can reserve yourself that is!). When I took that first bite of Crack Pie I actually ‘yummed’ out loud. In public! It’s so moist, the cookie crust almost disappears into the gooey caramel filling with the edges giving that much needed bite. It’s a perfect combination of smooth, sweet caramel and oaty crumble, with a hint of spice (from the speculoos) and a tang of salt. The slice quickly disappeared before my eyes and the whole pie was gone within minutes. Without doubt a wonderful sign of an excellent pie. As this is a recipe for 2 Crack Pies, you could scale it back to make just the one. But I fear one will never be enough! If you have the ingredients you may as well make two and share with friends (if you like anyone enough to share your Crack Pie with them) or alternatively gorge yourself on all of the pie. (Please eat your Crack Pie responsibly) Or even more sensibly you could freeze your second Crack Pie for a special occasion. 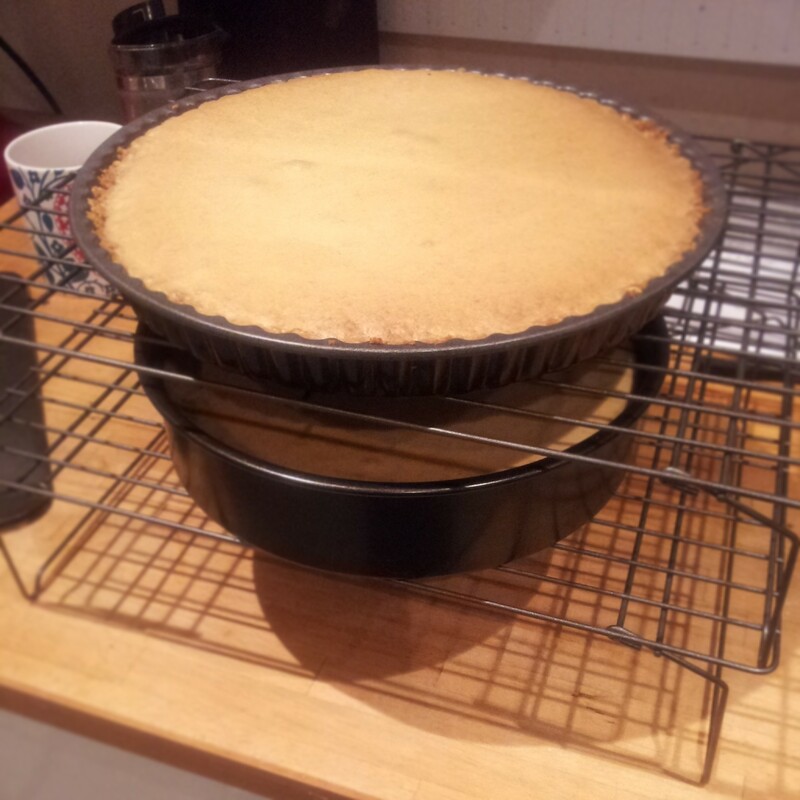 I have my Crack Pie resting carefully in the freezer, wrapped diligently in greaseproof paper and tin foil (still in it’s tin) to prevent freezerburn and that distinctive ‘freezer flavour’ contamination. I literally can’t wait to defrost it. 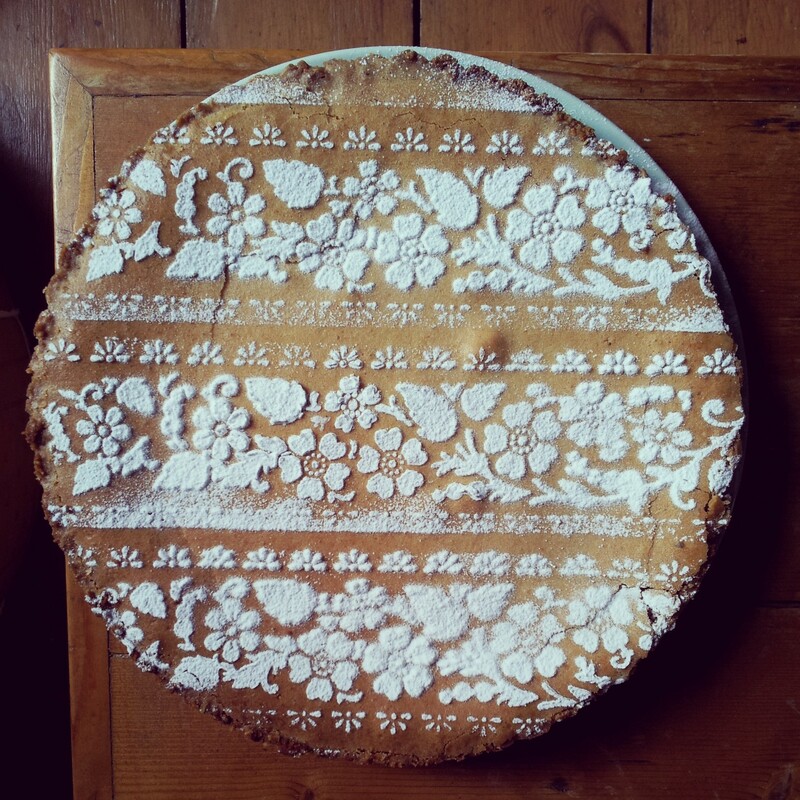 How to dress a Crack Pie? 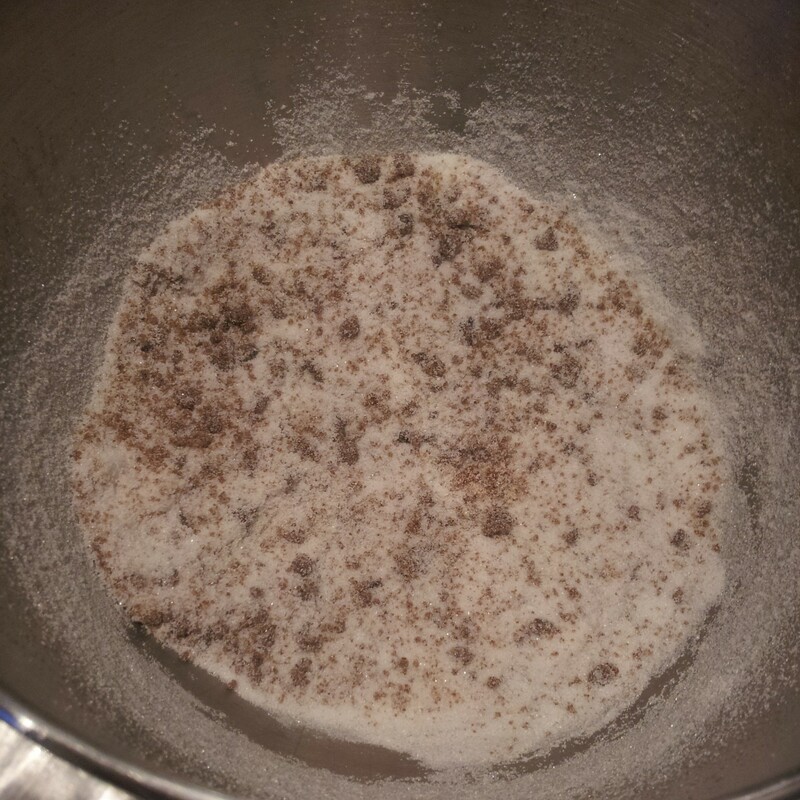 1g Cream of tartar (1/8 teaspoon) – This should actually be bicarbonate of soda however I got the pots mixed up! It didn’t seem to do any harm so I will be using cream of tartar in the future. 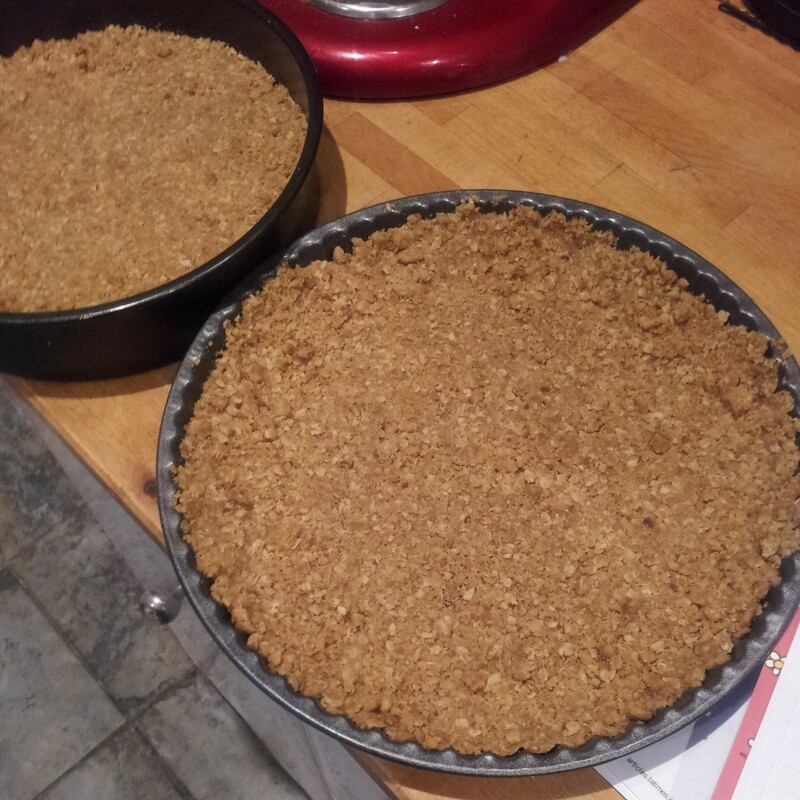 Step 6: Split the crumbs in half and press firmly and evenly into 2 (approximately 9 inch) pie tins all over the base and up the sides to form a thin crust. Pop the crusts in the fridge to set. Step 10: Bake the pies side by side in a preheated oven on a hot baking sheet for 15 minutes at 17o degrees C (350F) then turn the oven down to 160 degrees C (325F) and bake for a further 10 minutes. When golden all over and only ever so slightly jiggly your Crack Pie is ready! Step 11: Allow your pies to cool and dress with icing sugar. Then reward yourself for all of your efforts with a slab of pie. Enjoy! Also, I’ve been reading your blog for awhile, and love it!